Two-thirds of primary liver cancer patients and 90 percent of secondary liver cancer patients have inoperable tumors that are unresponsive to systemic chemotherapy and may benefit from transarterial chemoembolization or radioembolization with yttrium-90 (Y-90), both minimally-invasive, palliative procedures. Although research shows transarterial chemoembolization and Y-90 are usually equivalent treatments for most intermediate-stage hepatocellular carcinomas (HCCs)1, Heart and Vascular Institute considers tumor blood supply when deciding which therapy would be most beneficial for a specific patient. Image on the left: Pre-chemoembolization axial, contrast-enhanced CT scan at the level of the liver. White arrow shows a hypervascular lesion (33.8 mm x 31.6 mm) in segment 7 of the liver consistent with hepatocellular carcinoma. Image on the right: Post-chemoembolization axial, contrast-enhanced CT scan at the same level as the previous image. White arrows show the treated lesion (22.4 mm x 24.0 mm) in segment 7. The lesion is no longer enhancing and has decreased in size. Chemoembolization involves injection of 100-300 micron microspheres loaded with chemotherapy to block arteries that feed tumors, and to deliver chemotherapy directly to the tumor, sparing normal liver tissue. The team at Penn State Health Milton S. Hershey Medical Center tends to use chemoembolization for HCC and other hypervascular tumors that draw more blood flow than the surrounding tissue, including neuroendocrine tumors. 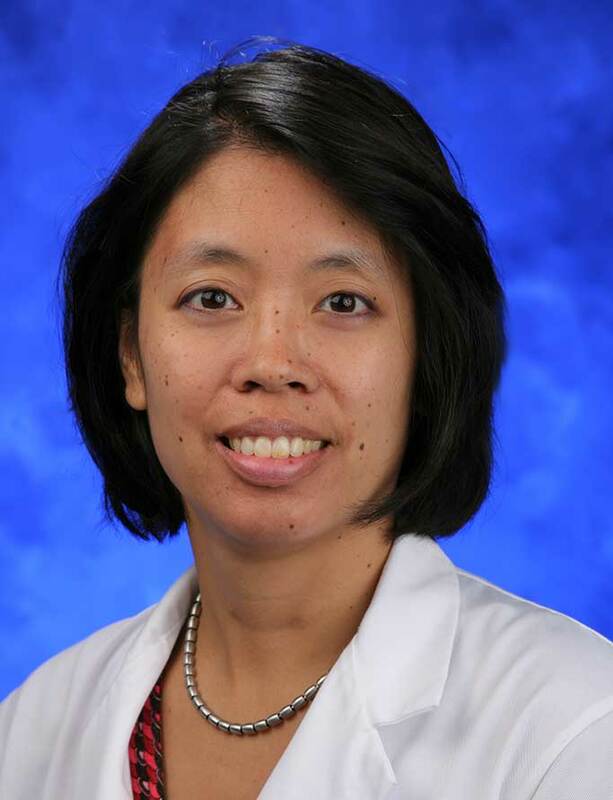 “Any embolic material put into the arteries supplying the tumor and adjacent parenchyma is more likely to distribute in the area of higher blood flow,” explains Allene Salcedo Burdette, MD, assistant professor of radiology, surgery and medicine. Radioembolization delivers a targeted, high dose of radiation, 20-60 micron microspheres, via smaller delivery. The microspheres act as Y-90 delivery devices and enable radiation to distribute more distally “and more widely in hypovascular tumors that don’t attract a great deal of blood flow, compared to a tumor that draws a lot of blood,” Dr. Burdette adds. Mapping angiography with a radiotracer agent, performed prior to radioembolization, determines if Y-90 is safe for individual patients by mimicking Y-90 distribution. If the tracer is found in surrounding, non-hepatic tissues or an excessive amount enters the lungs, Y-90 therapy is deemed unsafe. At Hershey Medical Center, Y-90 is typically used for radioembolization of hypovascular metastases in the liver, such as colorectal cancer. Side effects of chemoembolization include flu-like symptoms and pain lasting from a few days to a few weeks; however, some patients have no adverse effects. Y-90 patients tend to better tolerate treatment, yet experience significant fatigue. “Chemoembolization and Y-90 are minimally invasive options, and have real effect in prolonging patients’ lives,” Dr. Burdette emphasizes. Residency: Diagnostic radiology, Penn State Health Milton S. Hershey Medical Center, Hershey, Pa.
Medical School: University of Kentucky College of Medicine, Lexington, Ky.
Fidelman N, Kerlan RK Jr. Transarterial Chemoembolization and (90) Y Radioembolization for hepatocellular carcinoma: review of current applications beyond intermediate-stage disease. AJR Am J Roentgenol. 2015 Oct;205(4):742-52.
http://www.medscape.com/viewarticle/719102#vp_4. Accessed March 1, 2016. Douglas E. Ramsey, AB; Jean-Francois H. Geschwind, MD. Chemoembolization of unresectable hepatocellular carcinoma: a review. Appl Radiol. 2004;33(3). Penn State Heart and Vascular Institute (PSHVI) is a national model for comprehensive heart and vascular care, research, and medical education. The Society of Thoracic Surgeons ranked PSHVI among the most elite programs in the nation, with a three-star rating. We serve as the only heart transplant center in central Pennsylvania, including artificial heart placement. World-renowned doctors, skilled physician extenders, and Magnet-recognized nurses work together to provide advanced care for both common and complex heart and vascular conditions. PSHVI provides options for treating structural heart disease, including TVAR, Watchman and MitraClip, and delivers Joint Commission-accredited programs in advanced heart failure and implanting ventricular assist devices as a long-term treatment or as a bridge to heart transplant. Our PSHVI physicians and scientists are committed to advancing the knowledge of causes and effects of cardiovascular disease through research and clinical trials and to training the physicians of the future.